I am overwhelmed with all the awards I’ve been nominated for lately! I never meant to let them accumulate like this, but now that it’s happened, I just decided to respond to them all in one day. So, let’s get this started! So, many thanks to My Tiny Obsessions for nominating me for the Creative Blogger Award! I always enjoy our discussions in the comments and on Twitter and your blog is truly amazing. 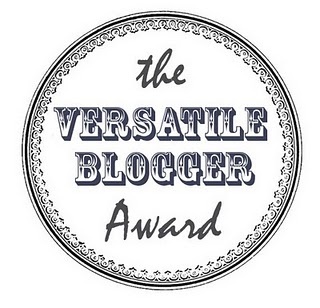 And also thanks to Abi from FlickThrough for nominating me for the Versatile Blogger Award! I very much enjoy your blog growing and your reviews are always on point! Everyone go check out the work of both of these great bloggers! When I was little and bored, I wrote letters to celebrities which scored me some great autographs from Aaron Taylor-Johnson, Rachel McAdams, Alex O’Loughlin, Channing Tatum, Leighton Meester, Ben Bass and some others. But since I don’t remember what I wrote in the letters I wonder if there’s something to feel a little embarrassed about now. I’d prefer visiting a country with mild to cold climate over a hot one any day. Sometimes my thoughts are in English even though my primary language is German. I’ve spent 6 months during High School in Oregon and 3 months working in France for a summer. Nothing is stranger than coming home after times like these. I have a complete collection of all the Charmed trading cards even though they were never sold in my country. Wow, agree with you on the weather!!! So Much! Nr 3 also happens to me, despite my first language being Portuguese and me living in a bilingual city (castellano + catalan). The language thing was sooo weird at first, but it’s almost normal now. YES! THEY ARE AWESOME! Maybe I’ll take pictures and show you later! I would love that 😀 ! Same here! I’d be totally fine with fall! Just any seasonal time really that isn’t as hot as the current one. I am so jealous of your Charmed trading cards. My dad got them on ebay for me! I was always so proud of them. Maybe I’ll post the pictures of them here on wordpress since a lot of people seem to be interested in them. That sounds great, I love the show so much. And thanks for all your comments on my reviews of the seasons. You’re welcome! It’s one of my all-time favourite shows. It just reminds me of my childhood and how we always used to make potions and write spells and fought over who could play which sister – fond memories! I’m glad my reviews seem to be doing it justice. The show deserves it as it is one of my favourites. Absolutely! You’re really doing a great job with them! Only the best for my fellow bloggers. Thanks, by the way do you ever visit the Ipc? Yes, not that often, but sometimes I do. Just wanted to tell you that his Shitfest is in full swing and I contributed a review. Awesome! I’ll make sure to check it out! Cheers, the review is of Magic Mike.